„The European Union was a dream of few. It became a hope for many. Today it is a necessity for all of us”. Already in 1954, the former German chancellor Konrad Adenauer declared this still having the echoes of World War II in his mind. From today’s perspective and from my point of view, being a member of a young European generation, I look differently on Konrad Adenauer’s Europe than he did. Never having faced war but having always lived in prosperity, I must keep in mind, that times have not always been that peaceful and democratic as they are today. A glimpse behind the ostensibly peaceful curtain reveals that every now and then strong anti-European forces emerged and endangered this dream. In this article, I want to shed light on current developments in Poland: 27 years after the change from communism to democracy populistic forces seem to gain strength. On the one hand, the discussions in and about Poland focus on political slogans and populistic promises. On the other hand, we watch a growing civil society engagement and its effort to prevent giving up basic democratic principles. Poland’s political situation changed after the last elections in fall 2015. The national-conservative party Prawo i Sprawiedliwość (Law and Justice, PiS is the polish abbreviation) won and is governing since than with outright majority. The first debates about the future of the Constitutional Court started shortly after the election in December 2015. This debate lead into proposals of general changes within the juridical system in Poland. In 2017, the government introduced a bill to change the way judges from district courts up to the Supreme Court can be appointed. The proposal would make it possible to remove judges from office from the Supreme Court by a governmental decision. Further, judges would be elected by both the Minister of Justice and the President. In consequence, the courts would no longer be neutral and independent in their duties. The government argued that a lot of judges still have communistic roots and therefore should be removed in order to free the juridical system in Poland from the previous systems influence. The fact that the average age among the judges is too young to be influenced by the former system, did not count for the logic of PiS. Demonstrations against the legal proposal took place in July 2017 in small towns and big cities all over Poland as well as in polish communities in foreign countries like Germany. So far only those Poles demonstrated who remember the time of the communist era, trying to avoid a shift back to that times. That changed with the mobilization of the young generation. The demonstration on July 20th in Warsaw was one of the biggest in that city since the end of communism. Young Poles, who previously only marginally participated in political activities, actively participated in demonstrations. It looks like if this generation noticed that its effort for continuing a democratic Poland is inevitable. However, the demonstrations seemed to mark a turning point on Poland’s way to an autocratic state. Interestingly, however, the Minister of the Interior denied the demonstrations taking place. The state affiliated media only spoke about a few hundred “pedestrians” being out for a walk that evening. This comes very close to censorship. Yet the demonstrators were at least partly successful. President Andrzej Duda (PiS) rejected two of the three proposals on July 24th. He declared not to sign all of them because of – and that’s the official version for the public – his personal worries about their contents. He declared the intention to present his own proposals instead. Such would most probably strengthen his own role in the process of electing new judges. Poland’s chancellor Beata Szydło (PiS) and the Minister of Defense, Antoni Macierewicz (PiS) spoke about a slowed down reformation process in Poland. No doubt, this topic will again be part of the political agenda within short time, albeit in a new look. Right after their defeat, the PiS-led government started talking about demands for reparations against Germany. This topic is dominating the german-polish relationship nowadays. The secret head of PiS, Jarosław Kaczyński, announced a „historical counterattack”. In his opinion, Germany refused to take responsibility for World War II. He declared this in the radio station “Radio Maryja”, a national right wing station with close ties to the head of PiS. Yet Poland announced already in 1953 to waive reparations from Germany, because the former German Democratic Republic (GDR) had already paid a large amount. Thus, until today, this chapter seemed to be closed. Today`s government justifies its decision with pressure by the Soviet Union, which forced Poland to waive reparations. It argues that Poland used to be a communist marionette and accentuates that Poland had no free choice at the time of making that decision. The weekly magazine “Wprost”, which supports the government, reported that the sum may amount up to roughly 50 billion Polish Zloty. According to the Minister of Foreign Affairs, Witold Waszczykowski (PiS), Poland has a right to claim four billion Polish Zloty dollars in reparations. This would not only be the amount for damages caused to Poland but also for the pain and suffering during occupation and war. Germany rejected this demand and declared that this topic has already been politically and juridically settled. During the election campaign in the year 2015, PiS drew attention to itself by calling an EU based decline in morals and warned about refugees, which “would bring terrorism and diseases”. 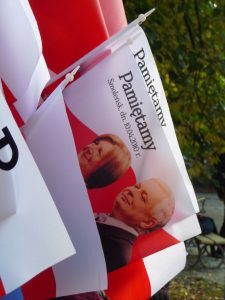 In 2015, PiS used the dissatisfaction within the Polish society about the ruling Platforma Obywatelska with Elżbieta Kopacz as its head, and represented itself as an alternative able to solve social and political problems. The polish author Jacek Dehnel, a promising writer and member of the young polish generation, talked in the German daily newspaper Süddeutsche Zeitung about a necessary inventory of the political system in Poland in order to understand the current situation. PiS was founded in 2001 and already won the elections in 2005. PiS had then started a so called “ethnicity war” during its period in office from 2005 until 2007. PiS politicians are constantly talking about decommunization and pushed politicians, judges and high officers to bare themselves in the so called “lustracja”. This meant X-raying the political past of these people in order to identify if they had been employees of the communistic security system. This logic seems to be continued in the current discussion about the judges of the Supreme Court: The current motive is to get rid of communistic influences within the juridical system. PiS installed specific discourses in the society and provoked fear of containing surviving communism in Poland. At the same time, it established normative guidelines and until today categories people as communists or non-communists. On October 1st, 2017, the so called “ustawa dezubekizacyna” came into force. This law enables to lower the pension of public officials, who served for the communistic system in Poland between 1945 and 1990. PiS argues that the pensions of those who did not serve Poland during the communistic era should not be higher than the pensions of “loyal Poles”. The Prime Minister Beata Szydło (PiS) further says that this law will reinstall justice in Poland and help to close the gap between the shameful past of this people and their high pensions. Although, this happens with a conspicuous inconsequence: members of parliament like Stanisław Piotrowicz (PiS) have a communist background (he was an executive for the Polish United Workers Party (PZPR) in Krosno) for which he was not “punished”, while highly supporting the idea of “lustracja”. Even Jarosław Kaczyński (PiS) was influenced by communistic ideas but this is seen as exception, which according to the logic of PiS does not count. In 2015, Kaczyński took up the myth of Poland’s threat from the outside. He declared that foreign media have the tradition to condemn Poland. He called this a “national betrayal” and linked this to his narrative on “ethnic patriotism”. He especially focused on Poles living in foreign countries blaming them for lack of loyalty towards Poland. Kaczyński also declared that this betrayal is not a result of individual decisions, but “genetically determined”. The Member of parliament Marek Suski, former campaign coordinator of PiS in 2005, declared in this case that patriotism is passed on from ones’ ancestors. In this logic, today’s patriotic Poles got their loyalty because of their patriotic behavior of their ancestors. The other way around it means that people, whose ancestors for example collaborated with the communistic system are not able to be “loyal Poles” today, because of their genetically passed tendency of disloyalty against Poland. This concept of communistic influences got a first peak in 2010 after the crash of the presidential plane in Smolensk (Russia). There, not only the twin brother of Jarosław Kaczyński, Lech Kaczyński (PiS) died, but also a high number of members of the polish Parliament, the government as well as of the armed forces. According to Kaczyński, the crash was a result of a conspiracy between Wladimir Putin and Donald Tusk, the than minister-president of Poland. The crash happened 2010, during the time of Polish election campaigns, which took place in 2011. Only a few days after the crash, the first conspiracy theories showed up. PiS argued that the crash was initiated to prevent a re-election of Lech Kaczyński, the at that time president of Poland. 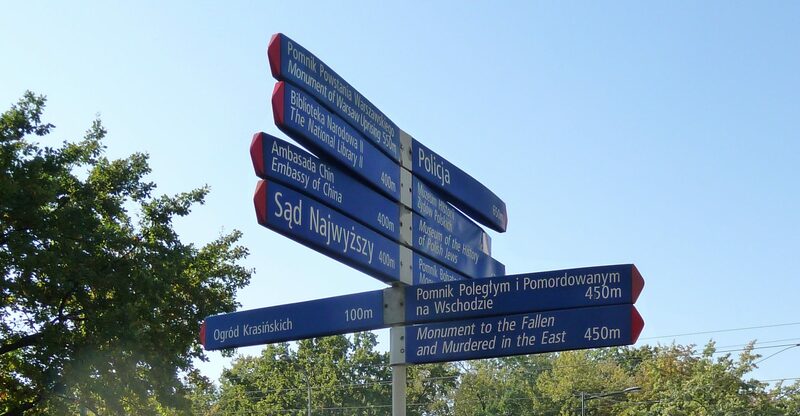 In addition, PiS reminded the Katyń massacre of 1940, when about 4000 Polish officers were murdered by Soviet soldiers, perfectly fitting in this context. The mention of this undoubtedly dark chapter of Polish history underlined his argumentation of the threat of (not only today’s) Russia, which, so do I assume, he considers in its politics as a continuation of the Soviet Union. Since 2010, while still being in opposition, PiS started using radical rhetoric. In the case of the crash in Smoleńsk, an investigating committee was set up by the ruling PO in order to find out the reasons for the crash. However, PiS doubted the independence of the official experts and set up its own investigating committee. It, once again, suspected a conspiracy between the ruling PO and Russia. In consequence, PiS developed a cult around the tragedy of Smoleńsk and a lot of people until today believe in this theory of betrayal. In Poland, right-wing Catholic PiS supporters hold monthly commemorative ceremonies to remember – and that’s an interesting term – this “crime”. But there are not only piety commemorations regarding Smoleńsk. Supporters of the theory of conspiracy fast radicalized and showed up with posters with slogans about “murders, traitors and slaves of Russia”. This message addresses those who do not believe this theory of conspiracy but lean towards an explanation based upon arguments of technical and human failure – at the time of the flight, Smoleńsk was covered in dense fog. It frames the official investigation of the catastrophic airplane crash as a “lie of Smoleńsk” in order to question the political credibility of the previously governing PO. Until today it is possible to buy flags and other commemorative accessories to remember not only the crash itself, but also the way PiS looks at it. The peak was reached with the movie Smoleńsk, which came out in 2016 and was highly influenced by PiS and their ideas of the crash. According to the german newspaper Tageszeitung (TAZ), the film flopped and is considered as one of the worst in the history of the polish cinema. Kaczyński considers his party members as his own loyal soldiers, but looks at ordinary Poles either as on traitors or heroes, depending on their loyalty to Poland. Interestingly, he never made concrete accusations towards a person and his arguments against the previous political establishment were always vague with indirect allegations. This made him immune against criticism or legal consequences. The next election will come up in 2019, but today there is no convincing opposition that might win the majority of votes. One can only hope that an opposition will rise out from the ash like a phoenix – hopefully right in time. Katharina Schuchardt: Poland – Quo vadis? In: RUB Europadialog, 2017. URL: http://rub-europadialog.eu/poland-quo-vadis (19.10.2017). Original: „Die Einheit Europas war ein Traum von wenigen. Sie wurde eine Hoffnung für viele. Sie ist heute eine Notwendigkeit für uns alle” (Konrad Adenauer).